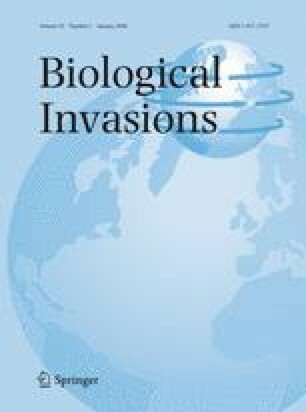 Successful establishment and spread of biological invaders may be promoted by the absence of population-regulating enemies such as pathogens, parasites or predators. This may come about when introduced taxa are missing enemies from their native habitats, or through immunity to enemies within invaded habitats. Here we provide field evidence that trematode parasites are absent in a highly invasive morph of the gastropod Melanoides tuberculata in Lake Malawi, and that the invasive morph is resistant to indigenous trematodes that castrate and induce gigantism in native M. tuberculata. Since helminth infections can strongly influence host population abundances in other host-parasite systems, this enemy release may have provided an advantage to the invasive morph in terms of reproductive capacity and survivorship. We thank the Department of Fisheries for support during our research programme. We also thank Alan Smith, Paul Nichols, Kate Jones and Tom Woolford for assistance surveying molluscs, Jan van Arkel for photography, and C. van Oosterhout and one anonymous reviewer for helpful comments. This work was primarily funded by European Commission Marie Curie Fellowship HPMF-CT-2000–79.